The Wedding Ring quilt block is a five patch block, because it is created on a 5 x 5 grid. It is made only with squares and half square triangles so it is a easy block to assemble. 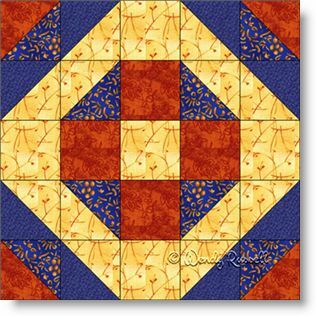 Speaking of assembly, many quilters choose to sew this block together as five separate rows. I prefer to assemble the block as an uneven nine patch as I find it easier to work with larger grouping of patches rather than rows. However, neither is correct -- it is simply a preference. The sample quilt illustrated give you two different looks, simply by choosing to set the blocks side by side or on point. The resultant quilt focuses on a different aspect than the other setting choice.